The Arlington Elementary Reading Intervention Program uses a Response to Intervention (RTI), three-tiered, service delivery model. Tier I reading instruction is provided by the classroom teacher with support by literacy coaches. I provide Tier II and Tier III intervention services along with the classroom teacher, the Title I Literacy Tutor, and/or Special Education Staff. My student learning goals are aligned with the town wide Teaching and Learning Reading Curriculum. Students in the reading room are developing the essential components of reading- Phonemic Awareness, Phonics, Fluency, Vocabulary, and Comprehension through multi-sensory structured instruction. Material is presented in a variety of modalities including visual, auditory, movement, and touch. The students are using their bodies to make short vowels, singing songs to develop early reading behaviors of matching word to print, manipulating magnetic tiles, sand, textured letters, etc., moving between table activities and bean bag time, using ipads for fluency and comprehension, and other activities that use a variety of students' senses. In addition to developing the essential skills in reading I also aspire to make learning fun and develop an interest in life-long reading. 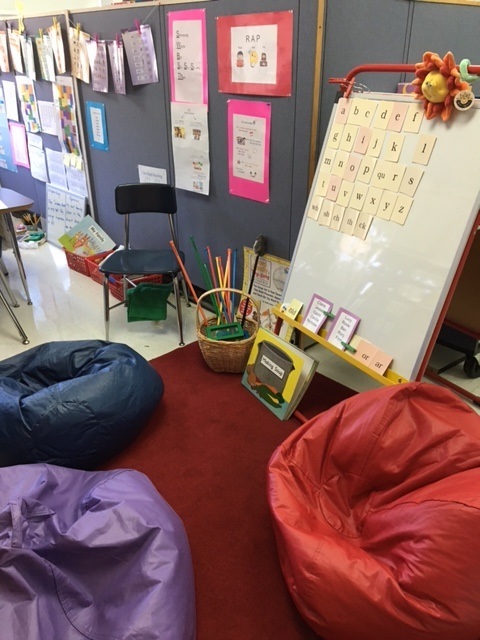 I have read a lot of the research in the area of reading motivation that informs my classroom design (more on the READING MOTIVATION page). This 2016-17 school year the Hardy Reading is fortunate to be staffed with three certified reading specialists: Claire Blumenfeld, Amy Walter, and Erin Pigott. This marks the beginning of my eighth year as Hardy's lead reading specialist. I was so fortunate to be hired by APS shortly after earning my CAGS, K-12 Reading at Lesley University. I also have a master's degree in early childhood education, am Wilson Certified, and continue to take courses through the Landmark School Outreach Program for Language-Based Learning Disabilities. Prior to my work as a reading teacher I taught Kindergarten and first grade for 12 years in the New York public school system and Belmont Day School in MA. I have two children of my own both of whom are Arlington High school graduates and currently attending college. I love being a part of the vibrant, supportive team at Hardy School and look forward to an exciting year with your children! Although classroom teachers have been very generous sharing tissues and wipes with the reading room I would happily accept any donations! Thank you in advance. I am thrilled to be joining Hardy and Brackett as a reading specialist this year. Last spring, I finished my certification to be a reading specialist, earning a CAGS, K-12 Reading at MGH's Institute of Health Professions. I spent the previous 9 years teaching third grade, 8 of which were at the Dallin School in Arlington. My first year teaching was spent in the mountains of Colorado after I finished my Masters in Educational Psychology at the University of Colorado, Denver. I am excited to transition into this new role and have enjoyed getting to know the students, teachers, and families at Hardy. I've also been transitioning into a new role at home, mother to my son, born last February. I am excited to begin my first year teaching reading at Hardy Elementary School. Thank you to the students, staff and families for the warm welcome. Already it has been a pleasure to meet you and READ with you! I come to Hardy after teaching reading for 6 years in Concord, Massachusetts. I am a certified reading specialist with a masters degree in education from Lesley University. I love to READ, play tennis and spend time with my husband and two sons.